This second phase of the Lower Sandy Restoration Implementation includes a streamlined approach to reactivate and extend the seasonality of surface flow to 3,000 feet of side channel. By enhancing the historic channel with engineered log jams and restoring of the channel alcove habitat, this project directly address identified factors that limit access to floodplain and off-channel habitat for ESA-listed species. In-stream portions of this project are located within YMCA’s Camp Collins property, which is immediately adjacent to Metro’s Oxbow Regional Park. Restoration projects focus in priority areas identified as high potential by Sandy River Basin Partners restoration assessments, modeling and plans: the Salmon River, Still Creek and the mainstem Sandy from the Zigzag River to the Sandy Delta. Next stop: Camp Collins. 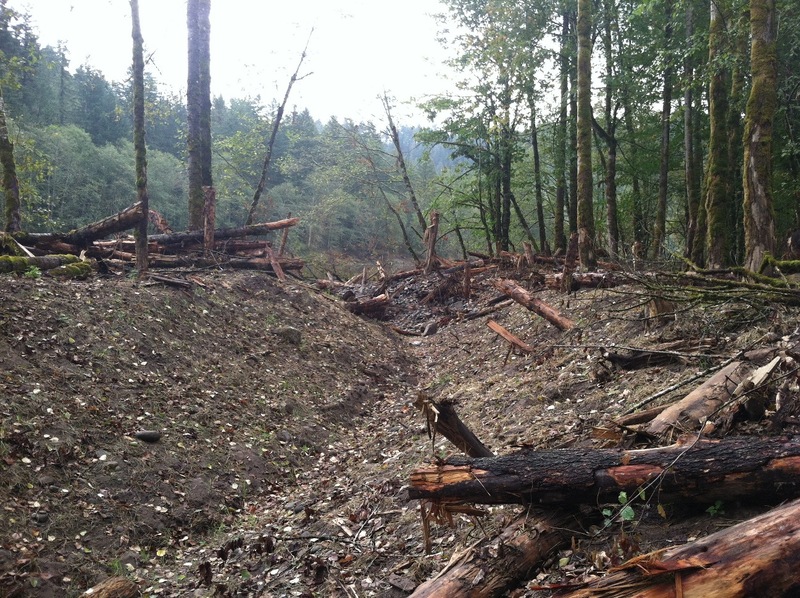 These logs will be used to create in-stream habitat for wild salmon. Project goals include creating higher quality year-round rearing habitat for migrating juvenile coho, spring and fall Chinook, and steelhead and restoration of natural flood storage capacity. The first phase of the Lower Sandy Restoration directly upstream from Camp Collins has already been a success. Happy Creek was flowing and creating connectivity with the Sandy River during the first storm of the season, around September 30, 2013.